India started their crucial tour of UK with an impressive 76 run win over Ireland in their opening T-20 game. The two and half month’s long tour is a perfect litmus test for Team India before the 2019 World Cup in England. Shikhar Dhawan and Rohit Sharma wreaked havoc against the Irish bowling line-up with an opening stand of 160 runs, creating the fourth highest opening partnership in T-20 internationals. On a disappointing day for Irish bowlers, Peter Chase produced a fine bowling display taking four wickets, three of which came in the final over including that of Virat Kohli who went down for a duck. India finished 208-4. 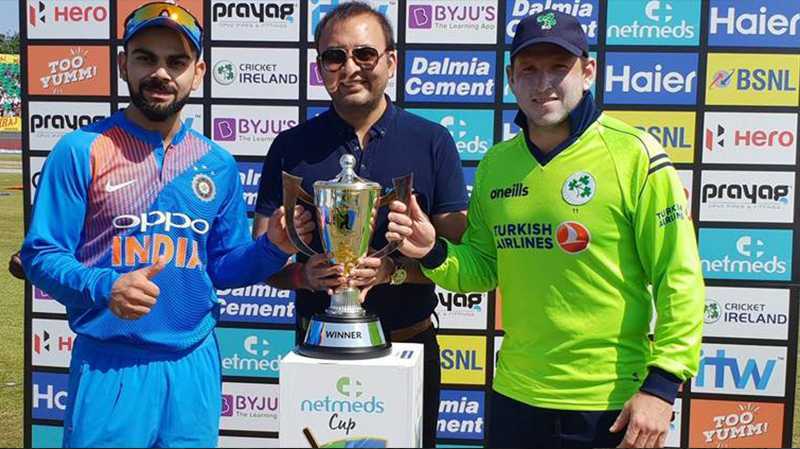 The decision to bowl first by the Ireland captain, Gary Wilson backfired tremendously as with India posting a massive total on a slow pitch. Missed catches, a parched outfield and Irish heat waves didn’t help the hosts at all. Things were looking ominous right from the start of the run chase for Ireland who saw their hitting opener Paul Stirling dismissed early. James Shanon’s inspired 60 runs from 35 deliveries gave the hosts some hope at 85-3 but the fall of Shanon triggered a collapse of the Irish batting line-up who finished 132-9 in 20 overs. Kuldeep Yadav continued his impressive form this season with a four-wicket hall including the crucial wicket of Shanon. He was superbly complemented by Yuzvendra Chahal who grabbed three wickets. India also missed a couple of easy catching opportunities, something they’ll have to work on as the tour progresses. With this impressive win over Ireland, India became the most successful team after 100 T-20 internationals; they have now registered 63 wins with Pakistan and South Africa jointly on the second spot with 59 wins each. India are set to play their final T-20 game against Ireland in the two-match series on June 29 before heading to Manchester for their opening T-20 encounter against England on July 3.